I have always enjoyed travelling. 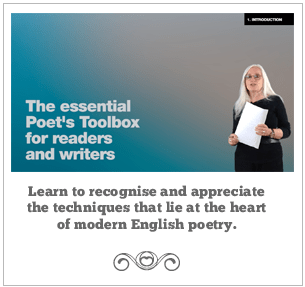 Not necessarily because I want to get somewhere in particular, but for the simple joy of the journey: the “time between places” when, particularly if you travel alone and on public transport, you can duck out of life and be someone else entirely. 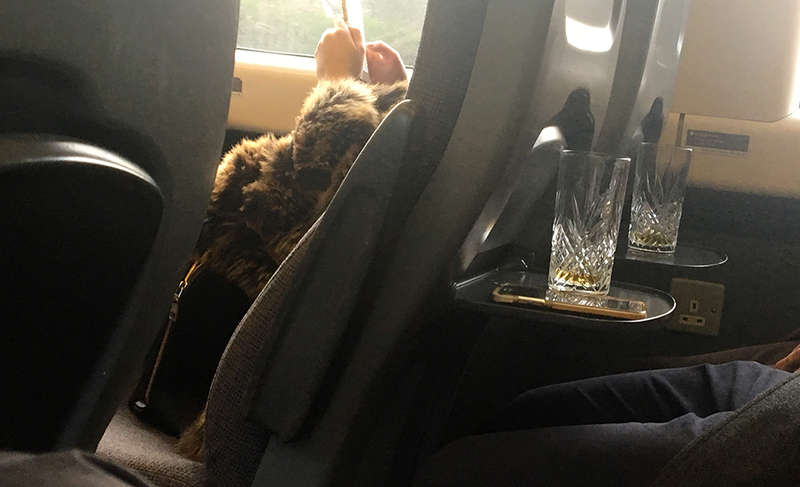 Chance encounters in the buffet car, casual conversations that crop up between complete strangers, momentary glimpses of other people’s lives, things seen from train windows – and, as in the photo above, sometimes even the trains themselves in their festive glad rags. Sadly, far too many UK station eateries have been replaced by generic American-style coffee shops, and even tea and shortbread fingers is almost prohibitively expensive, whether served at your seat or fetched from the onboard shop. But it seems that some people have their own ways of turning the journey into a small celebration: I don’t know where my fellow travellers had stashed their cut glass tumblers when they boarded the train the other morning without any luggage, and I’m not sure I’d have chosen a highball glass to drink whisky from, but the hip flask held more than you might have thought, and it all looked a lot more classy than the usual takeaway paper coffee cups. Although some UK bus stations have the same delightful range of pubs and cafés as train stations – and also have the advantage of allowing full access not just to passengers, but also to those who’ve merely come to see the travellers off or wait for them to arrive – I’m pretty sure that even long-distance coaches in the UK no longer boast an onboard steward. I used to love the hot soup and sandwiches served on the National Express service between South Wales and London Victoria: not the modern triangular packs you buy as part of a supermarket meal-deal, but fresh sandwiches made to order in the little contrived onboard galley. Still, I guess there’s nothing to stop you taking food on board with you. 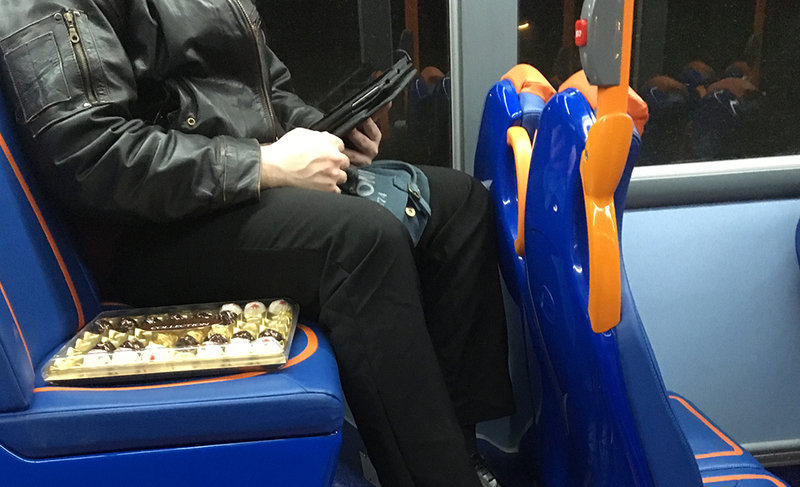 Personally, though, I’d prefer something rather plainer than the tray of luxury chocolates my fellow passenger had chosen for his waybread on the trip into town the other evening. It’s a while since I had to fly anywhere, but years ago, we used to get the early tube out to Heathrow for breakfast on a Sunday. And when I lived in Madrid, there was a local bus station where the café served the best toasted cheese sandwiches – just right to dunk in café con leche. I wonder what refreshments he chose for his journeys. I hope you have a wonderful journey this Season. Thanks. Of course travelling anywhere is pretty much impossible over the festivities – unless it’s by Shanks’s pony. Still, there’s always books and the journeys therein.